In what has become an annual event, the Policy & Politics conference was held in Bristol in September 2014. 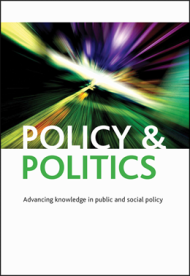 Policy & Politics is an academic journal that centres on the areas of public and social policy. The journal is published by Policy Press and has long been associated with the School for Policy Studies, who currently provide a co-editor (Sarah Ayres, Reader in Public Policy and Governance) and two Associate Editors (Noemi Lendvai, Lecturer in Comparative Public Policy, and David Sweeting, Senior Lecturer in Urban Studies). In the array of panels at this year’s Policy and Politics conference were three linked panels on directly elected mayors, containing twelve papers from five countries. These panels linked clearly to the overall conference theme of challenges of leadership in collaboration in the 21st century. Directly elected mayors are often seen as a reform to help improve the leadership of cities, in part by facilitating or leading collaboration between actors both within, and well beyond, the boundaries of urban areas. The panels, and the topic of directly elected mayors more generally, are addressed in Alex Marsh’s ‘Policy Unpacked’ series of podcasts, hosted on Alex’s blog. You can listen to the podcast here. David Sweeting is Senior Lecturer, and Alex Marsh is Professor, in the School for Policy Studies at the University of Bristol. Alex is also Head of the School.